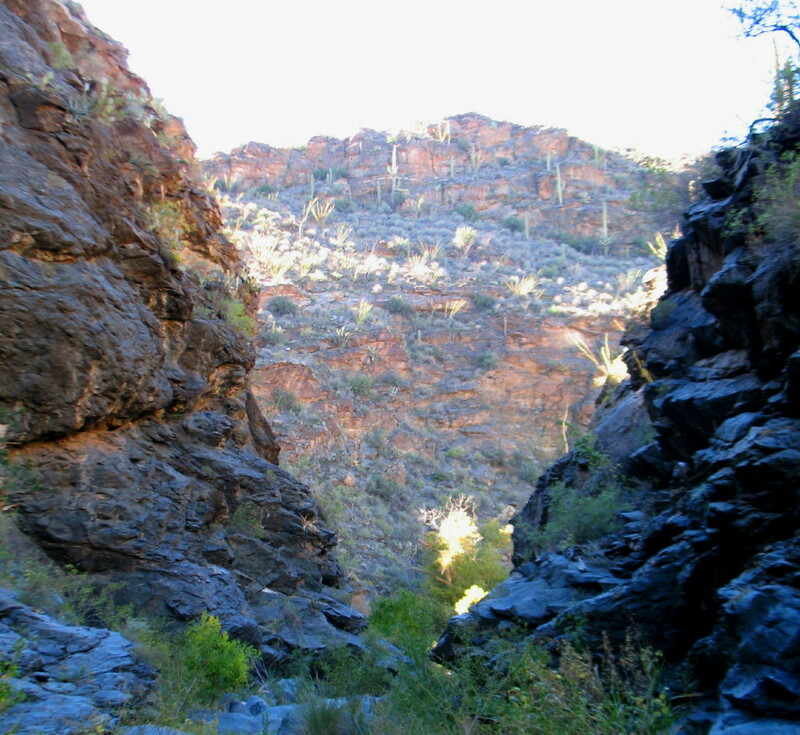 Last July, we had made plans to hike into a remote area of Happy Valley, “When the weather cools down.” Our friend Bruce told me of several fun things back in there and to expect some mild Canyoneering. We’ll follow his lead. DF, Bruce and myself, were the ones gathered on Sunday Morning. We loaded ourselves into my SUV. Back in October, hurricanes in Mexico’s Pacific waters had left us with some hard weather in Southern Arizona, including flooding and golf ball sized hail. When we arrived along the road into Happy Valley, we were pleasantly surprised to find water flowing over the road from the runoff of the mountains. The story begins. Remember, you can enhance any photo by clicking on it. I keep threatening to splash through these gullies, as we soak up the ambiance of tall trees and grassy hillsides. Blooms are coming out like springtime. Some hilltops in the distance look as if they were sprinkled with a thick layer of mustard. There is also a change in the colors of some of the trees. Golden hews explode out of the more usual green canopy. 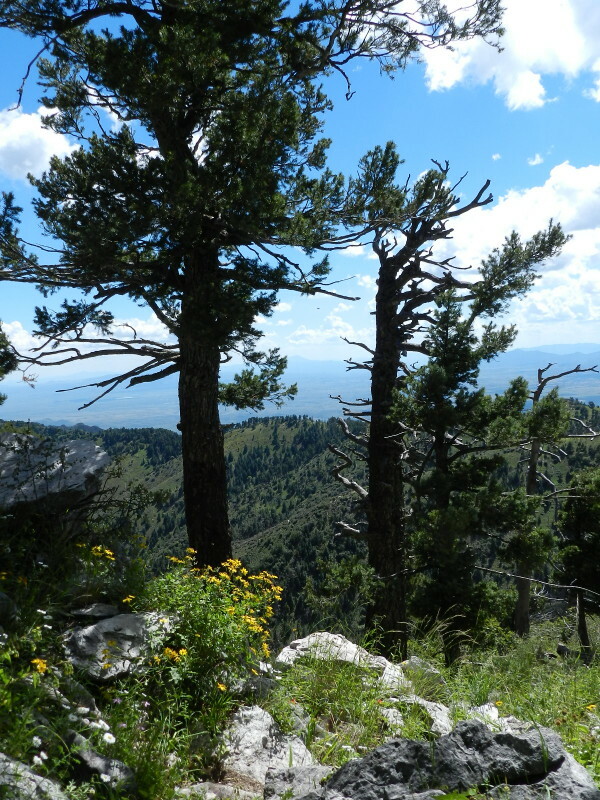 We have been up Carr Peak in the Huachuca Mountains. There could be a chance of rain on this mountaintop. We have a downhill walk after a long days hiking in wonderment. When it feels like time to return, I look to see what is happening with that large storm out west. It seems to be heading down into Mexico and might pass south of us. We haven’t brought our rain ponchos, Arizonans that we are. We speculate the chill that a storm like that could have on our unprotected bodies. We’ll keep one eye open. 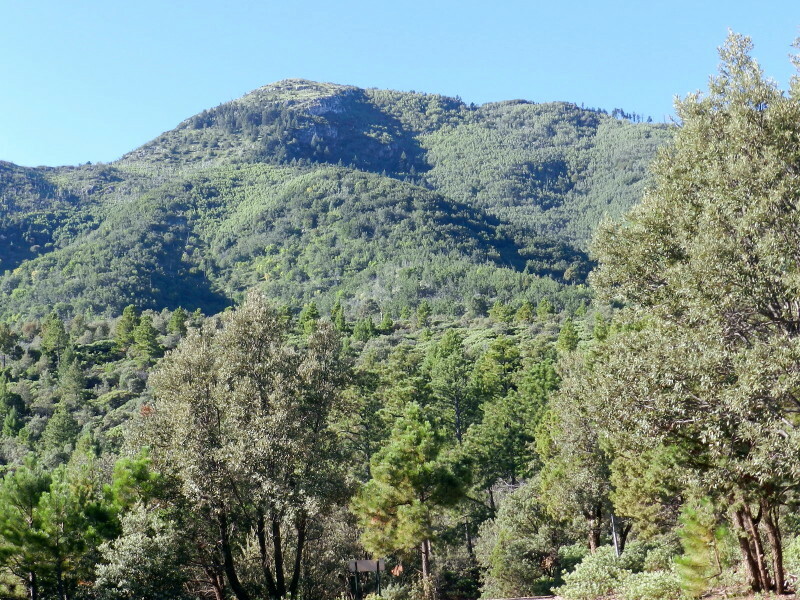 We’re walking up Carr Peak in the Huachuca Mountains. This day trip is exploratory and an experiment to gather full confidence to backpack to Miller Peak before the season’s end our opportunities. We are about to venture into one of the most astounding moments of a lifetime…naked. 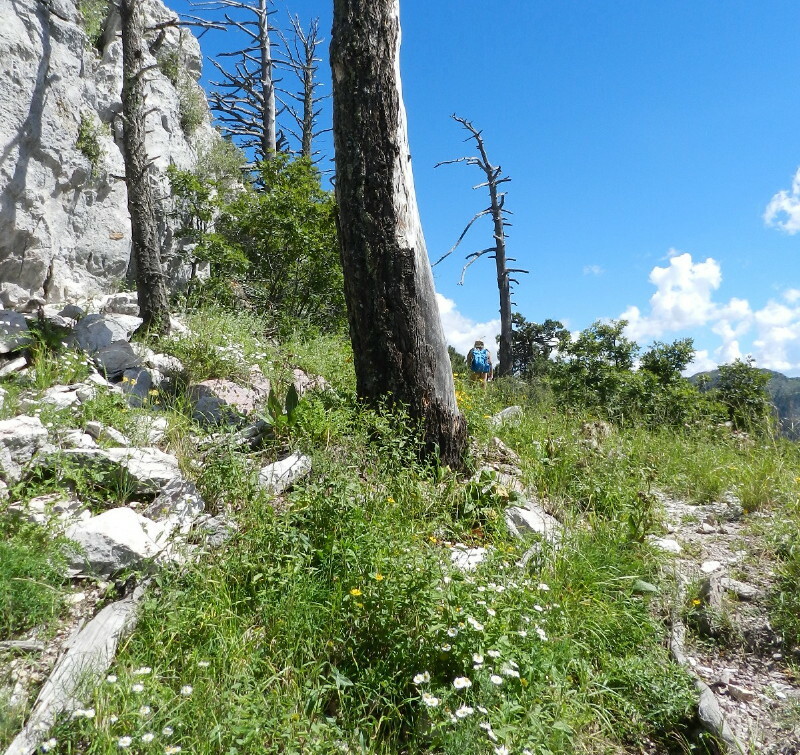 We have been doing more and more difficult climbs to be in shape for backpacking up to Miller Peak in the Huachuca Mountains. Carr Peak is a neighbor. Climbing it will tell us how much water we will have to carry to Miller Peak and give us a better idea of what is in store for us. By the end of this day, we will have had a cumulative elevation gain of around 2800 ft. and then back down, all in about six and a half miles. This will cover about half of the trek to Miller Peak. The monsoon rains are winding down. After weeks of nearly daily rains, these mountains may be in a floral splendor according to a Forest Ranger that I talked to. The weather is looking perfect, it’s in the mid-seventies and there is little chance of rain. We drive up Friday evening after work. I have the back of the SUV set up as a bed, so all that we have to do is eat, grab our bags and hit the trail Saturday morning. We have a short sunrise wander, just before the morning begins to warm. The tent is already heating up, but we slide back into bed. 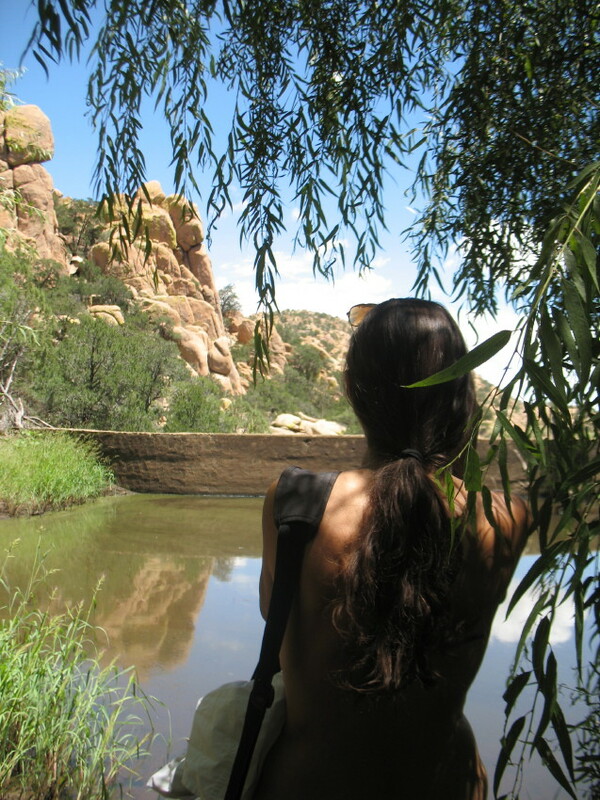 We are on a hike along the trail at Cochise Stronghold. We have found a pocket just before the season’s campground opening and been blessed with a cool day with the shade of a parade of fluffy clouds. We have reached our water source at Half Moon Tank. REMEMBER that you can enlarge and enhance any photo by clicking on it. 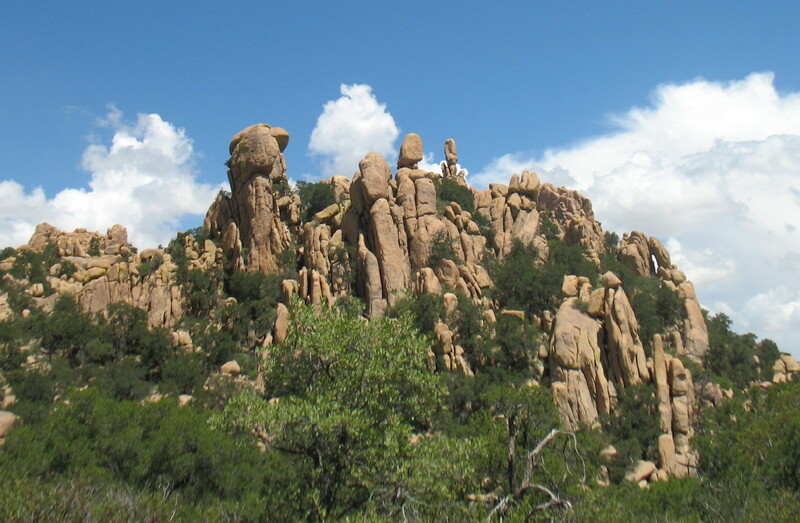 Cochise Stronghold is a part of the habitat of the Chiricahua Apaches. When settlers began to make their way into the area, destroying the lives of those who lived there, a “war” eventually broke out. 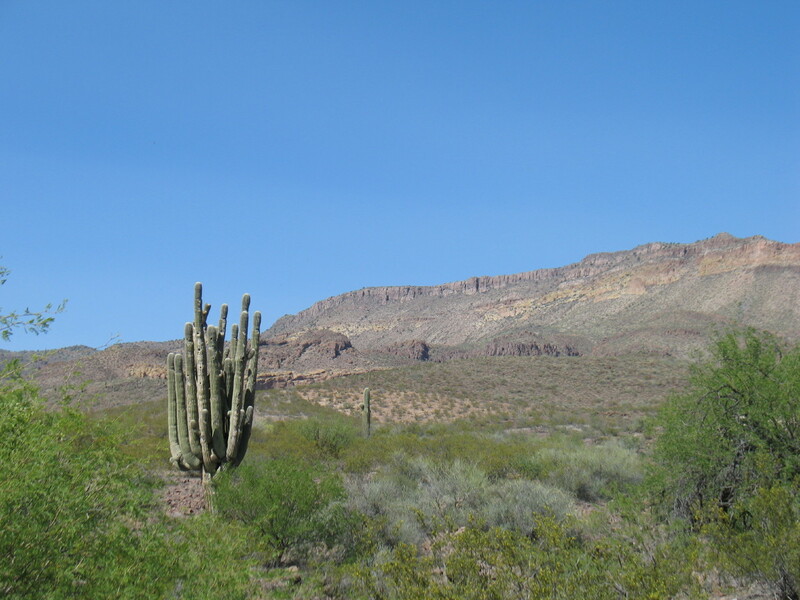 To put it briefly, Apache raids could be conducted from these safe rugged mountains. Cochise, who was initially prone to a peace, found himself accused of a crime. Then, members of his family were taken hostage. He then saw futility. There were white betrayals, which lead to more decades of war. 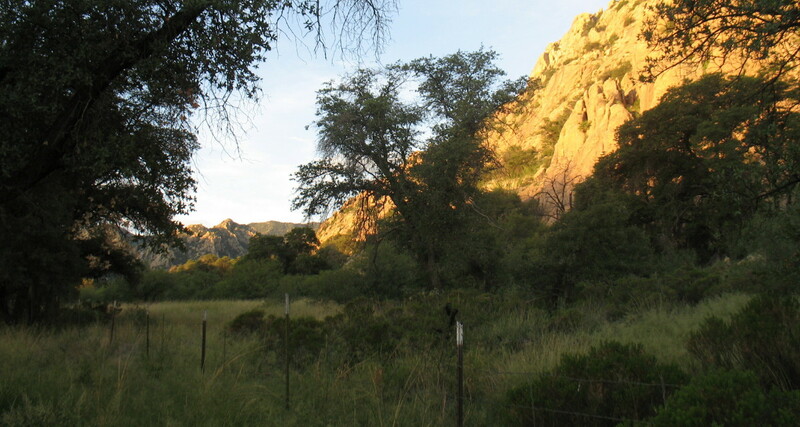 Eventually, Cochise died and was secretly buried in these mountains. As I walk through this incredible landscape of fortress-like boulders and hoodoos, I watch water leach out of rocks and then stream down them. I sit in the shade of many types of trees and consider the abundance hidden here. I hold thoughts of Apache lives. I ponder some nebulous foreign peoples beginning to force the takeover of my own homeland. I can imagine how I might feel and how I might react. REMEMBER that you can CLICK ANY PICTURE to enlarge and enhance.